One of the most popular three row midsize SUV's on the market today is the Ford Flex. Its performance and comfort features make it the first choice for thousands of car buyers every year. That is why our team of SUV experts at Arroway Ford located right here in Bedford Hills are so excited for the all-new 2019 model! The clearance between the ground and the vehicle is just under six inches which means it has never been easier to get both in and out of this vehicle meaning it's perfect for those with mobility issues or just those who put personal comfort at the top of their list of needs. 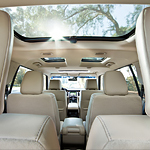 Additionally, the Ford Flex allows for more than 83 cubic feet of storage space which means the whole family will always be able to ride comfortable with room to spare even when also hauling all of the luggage for a big family road trip.